Nippon Toki Kaisha factory from a picture inside of a Noritake bowl dated February 19th, 1927, commemorating the new Showa emperor Hirohito's visit to the Nagoya factory in his second year on the throne. On the inside the picture is surrounded by the newly invented lusterware surface. Mark #978 - RC - "Royal Crockery" on top of a Yajirobe (toy of balance) symbol, symbolizing the balance in management. Registered in 1907 for domestic use (Japan). Pictures courtesy of Bill Little, 2004. However very well known, 'Noritake' as well as 'Nippon' are brands and products produced or sold by the Morimura Company of Japan. Most early pieces marked Nippon in western or in Japanese Kanji characters seems to have been manufactured by or sold through the company that later would become Noritake Company. In 1876 Baron Ichizaemon Morimura IV formed a trading company called Morimura Kumi (Morimura Brothers) with offices in Tokyo, and a retail and wholesale office in New York for the export of traditional Japanese products such as chinaware, curios, paper lanterns and other gift items. Ichizaemon Morimura VI was a visionary and a supporter of a modernization of Japan. One thing he clearly saw was the business potential if the quality of Japanese art and skilled craft could be adapted to the needs and taste of the American consumer. Morimura brothers was still a many faceted importing company of which the porcelain were just one part. Beside running a porcelain decorating facility of their own during 1878 to 1884, the Morimura brothers also bought and distributed porcelain blanks to be decorated by independent porcelain decorators in nearby regions. From 1884 Morimura Kumi subcontracted decorating firms in Tokyo, Nagoya and Kyoto. The quality of the Early Noritake wares varied with the skill of the individual decorators. The early marks from this period seems to have been the country of origin i.e Ni hon or "Nippon" written by brush in traditional Japanese Kanji characters. The word "Nippon " also meaning Japan but in western characters. A visit by Ichizaemon Morimura IV to the World Fair in Paris in this period helped shape the idea of trying to manufacture a high quality, modern, western style dinnerware for export, in Japan. 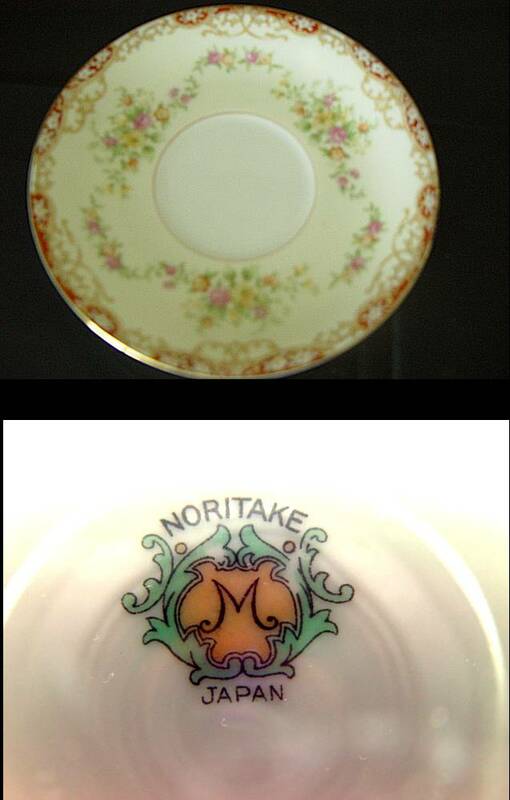 In January 1, 1904 the Nippon Toki Kaisha Ltd - the forerunner to the present Noritake Company - was formed. The factory was located near a source of good and plentiful raw materials and in a community rich with skilled potters. The site was the small village of Noritake near Nagoya, the center of Japan's ceramic production, on the main island of Honshu. The first Japanese registry for a Noritake back stamp is reported as 1908 for use in Japan. Marks with the initials RC have a special place in the Noritake production. The first time we find them in the first marks registered in Japan in the 1908, where RC (Royal Crockery) is combined with a "Yajirobe" or a mechanical balance toy. According to Noritake symbolizing the universal problem of finding a balance in business, such as between quality and price. It is not clear how long this symbol was used but already in 1911 the first marks with the famous laurel wreath was registered. In 1911 also a series of circular marks with the RC drawn in an Art Noveu style were registered in Japan. In 1926 a back stamp with RC (Royal Crockery) with a right turned laurel twig registered in India for India and Southeast Asian market was used for the first time. In 1910 the first china products from the new company could leave Japan for the U.S. The first reported U.S. registry for a Noritake back stamp for importing is 1911. Not not until 1914 after a long series of trials and errors the first fine porcelain dinnerware suitable for export was produced. On of the first patterns to be produces was the "Sedan" (11292). 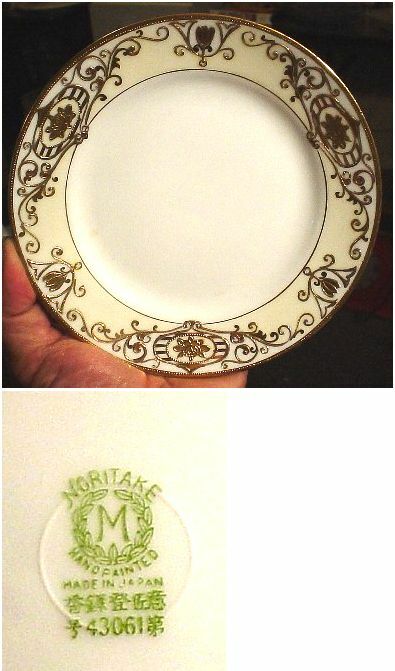 A piece of the dinnerware in the Noritake factory in Nagoya shows this to be a bleak white plate with a cream border of small flower sprays and the typical Noritake back stamp, the letter "M" in a wreath and the words "Hand painted." As a general rule the earliest dinnerware plates were mostly decorated with a liberal applications of gold. To identify the early Noritake porcelain, it is important to remember their intended adaptation to the western taste. The "M in a wreath" mark was used between c 1914 until 1940. With the first World War came the understanding of the need for industrialization. The company soon undertook the production of necessary machinery for the use in its potteries and could by the early 1920's introduce assembly line techniques allowing for mass production of high quality, yet affordable, dinnerware. From around the 1890's until 1921 the Nippon Toki Kaisha Ltd had according to the the McKinley Tariff Act of 1890 marked their export porcelain with their country of origin as in "Nippon" but in western characters, which is kind of fun in an upstanding Edo period Samurai way. For "Nippon" collectors the bad news is that this mark only signifies the country of origin and implies no other information. So, even if early Morimura imports were likely to have been marked this way, so would other imports from Japan too. After the WWI most back stamps was changed to state "Japan" or "Made in Japan". Still the word Nippon was infrequently used even after 1921. From the event of the back stamps giving up the "Nippon" mark and beginning with being marked "Japan" or "Made in Japan. i.e. in the early 1920's we can assume that all Noritake porcelain were actually designed in New York, for the US market. From the up market art deco designs of the late 1920s the designs of the 1930s took a markedly more pragmatic shape after the world-wide depression. Still, marketed in department stores and Five & Dimes, Noritake took "art deco" into Americas homes and onto their tables. 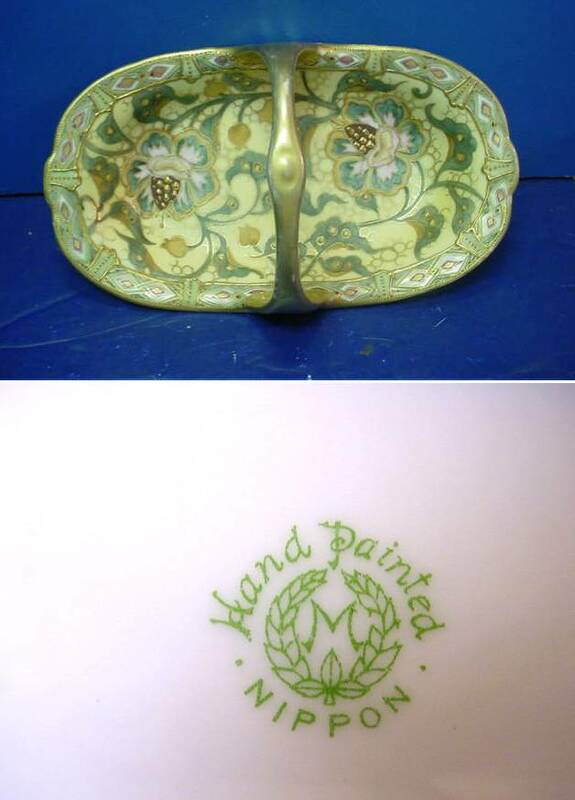 Much of the "lusterware" where a thin metallic film was applied over a bright single-color glaze, often with art deco theme decals in combination with hand painting, dates to this period. From its early understanding of western taste and mass production, Noritake also early understood the western methods of mass marketing. It is thus not surprising to from the late 1920's throughout the 1930's, until the bombing of Pearl Harbor on December 7, 1941 put a most unwanted stop to normal business, "Hand Painted Imported Noritake China" was offered as a premium by the Larkin company of Buffalo, New York, to its millions of customers purchasing soap, beauty and home products by mail. Some patterns appears to have been specially designed for the Larking company such as the "Azalea". Azalea was then sold as premiums to the Larkin club members and their home agents. Typical marks from the period c. 1925 to 1940 is the green Noritake mark #190. In 1941 the export offices were closed and direct export to the US was not resumed before 1948. Noritake wares from circa 1948 to 1952 may bear a number of marks including "Made in Occupied Japan" and "Occupied Japan." In 1963 the company started to use its English name Noritake Company Ltd to which the Japanese company also officially changed its name in 1981. 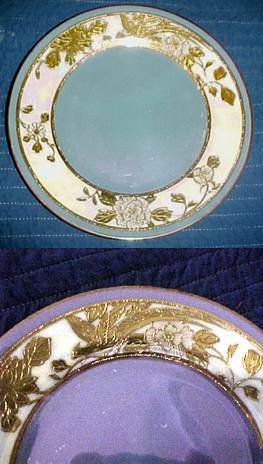 Early Noritake porcelain dinnerware featured the "Hand Painted Nippon" design around the familiar wreath-circled "M" for "Morimura" on the back stamp of most pieces. "Noritake" appears on back stamps of other pieces, with either "Japan" or "Made in Japan" present on most of these. For a period following World War II from 1945 to 1948 Noritake China was sold under the label "Rose China". In 1953 the letter "N" for "Noritake" in a wreath replaced the long used "M" in a wreath. From 1945 until early 1952, occupation of Japan by the Allied Occupation Forces had been in place and many backstamps for this period say "Made in Occupied Japan. According to collectors, the number of known different Noritake marks are today more then 400. Immediately after the second WW, in 1946, the Noritake was temporary dropped from the marks and RC was reappearing as "Rose China" together with a picture of a rose and the words Made in Japan. 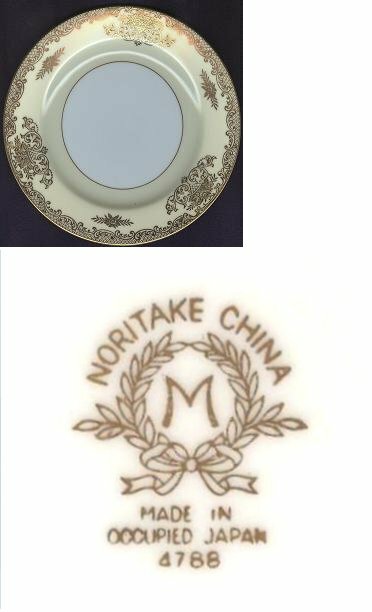 Since the quality immediately after the war was not up to the pre-war standard, Noritake preferred to save the valuable Noritake brand name until later, still already in the 1947 we find the Noritake name used together with the Komaru (overcoming difficulties) symbol, sometimes over the telltale line "Made in Occupied Japan". For today's collector, the ambiguities that surround Noritake and Morimura brothers can be overwhelming however improving knowledge and exchange of information between Japane and the West will eventually and gradually let us careful adding of one piece of information to another. 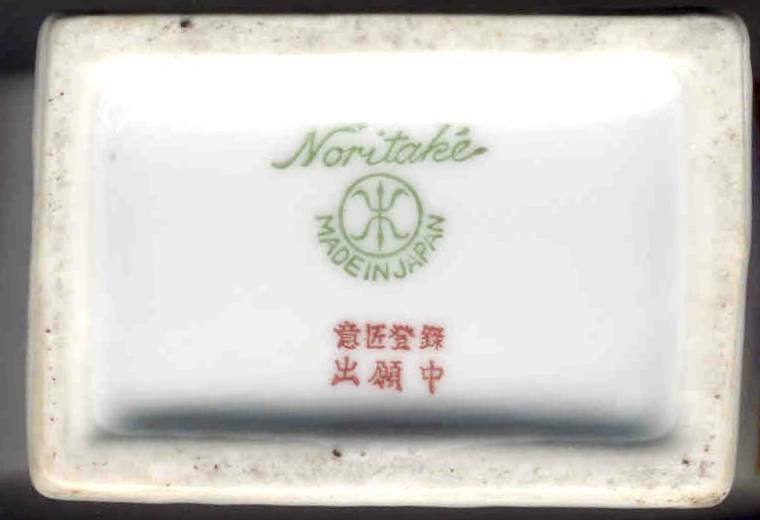 The first Japanese registry for a Noritake back stamp is reported as 1908 for use in Japan. 137. Mark: "Komaru" symbol. The center symbol said to be taken from the Japanese character "Komaru", meaning "overcoming difficulties". Crowned with "hand painted" and below the mark "Nippon". According to the Noritake company tradition this mark was designed when meeting the different culture of the west early in the 20th century caused many problems, also known as the "tree crest mark" which is the clan crest of the Morimura family. According to recent information from the Noritake Company the correct (current) term for this mark should be 'Maruki'. Very early mark, possibly the 1910's. 848. Mark: "Komaru" symbol. Crowned with "Noritake" and below the mark "Made In Japan". The center symbol said to be taken from the Japanese character "Komaru", meaning "overcoming difficulties". According to the Noritake company tradition this mark was designed when meeting the different culture of the west early in the 20th century caused many problems, also known as the "tree crest mark" which is the clan crest of the Morimura family. This mark is said to have been registered in London for the UK market already in the 1908. Notice the curled up ends of the Komaru symbol which distinguish this mark from later versions. 1044. Mark: "Komaru" symbol. This mark was registered in London in 1908 and in Japan three years later, and is thought to be specific for export pieces to the UK. The vase was obtained in an antique shop in Penang, Malaysia, and seems to date to 1920s or sllightly earlier. 693. Mark: "Komaru" symbol crowned by "Noritake" in handwritten logotype format and below, "Made in Japan". From the printed art deco design, a date around 1930 seems likely. 978. Mark: RC - "Royal Crockery" on top of a Yajirobe (toy of balance) symbol, symbolizing the balance in management. Registered in 1907 for domestic use (Japan). Occurs in two colors, pale green and magenta. Bowl dated February 19th, 1927, commemorating the new Showa emperor Hirohito's visit to the Nagoya factory in his second year on the throne. 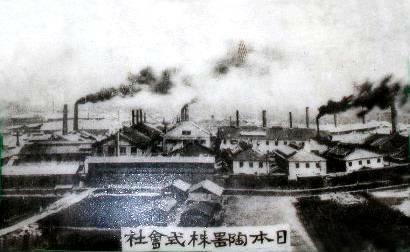 Inside, a photo of the Nippon Toki Kaisha factory surrounded with a lusterware surface. 135. Mark: "M" standing for "Morimura" in a wreath, crowned by "Hand painted" and below, NIPPON. Date: Introduced in 1911 and possible in use until 1921. The first reported U.S. registry for a Noritake back stamp for importing is 1911. Noritake first produced dinnerware for the American market in 1914. A piece of the dinnerware in the Noritake factory in Nagoya shows that the pattern was The Sedan (11292), a white body with cream border with a small spray of flowers. It bears a typical back stamp of Noritake, the letter "M" in a wreath and the words "Hand painted." 136. Mark: "M" for Morimura in a wreath, crowned by "NORITAKE" and below, "Hand painted" and "Made in Japan". The use of the "M" gives a date before 1953 when the long used "M" in a wreath was replaced with a "N" for Noritake. Until 1921 Noritake predominately marked export wares Nippon meaning Japan in Japanese, while most back stamps after 1921 state "Japan" or "Made in Japan." From the early 1920 and probably until 1940 most if not all US market patterns were designed in New York. Marks with US Design Patent Pending probably dates to this period, to whatever effect it might have had to stop other Japanese companies to copy the modern and successful Noritake designs. 1045. Mark: "M" in a wreath, upside down as compared to Noritake. The use of the "M" gives a date before 1953 but after 1921, from which time Japanese export companies mostly had begun to use "Japan" or "Made in Japan" in their marks. Joan C. Oates, in her book on Phoenix Bird china, attributes the M in upside-down wreath to the Noritake predecessors, the Morimura Brothers. Aimee Neff Aldren also records this as a Morimura Bros (Noritake) mark, dating post 1921 (her code MM-28), which is nor corroborated by Van Patten. I personally find it unlikely that this mark is Noritake since their corporate profile have always been to be of highest standard. Suggested date 1930s-50s. The star shape is a firing support mark for the base to rest on during firing to avoid sagging and deformation. 847. Most back stamps after 1921 state "Japan" or "Made in Japan." From the early 1920 and probably until 1940 most if not all US market patterns were designed in New York. Marks with US Design Patent Pending probably dates to this period, to whatever effect it might have had to stop other Japanese companies to copy the modern and successful Noritake designs. Date of this mark: probably c. 1930. 854. Mark: "M" for Morimura in a wreath, crowned by "NORITAKE" and below, "Hand painted" and "Made in Japan". This mark was registered in 1918 and seems to have come in to used in the early 1920's when it was used until around 1940, in combination with pattern names and number, and also some rows mentioning that a patent for the decoration was applied for. Tentative date; 1920's. 190. Mark: "M" for Morimura in a wreath, crowned by "NORITAKE" and below, "Hand painted" and "Made in Japan". This mark was registered in 1918 and seems to have come in to used in the early 1920's when it was used until around 1940, in combination with pattern names and number, and also some rows mentioning that a patent for the decoration was applied for. Tentative date; 1030's. 1157. Mark: Letter "M as in "Morimura" surrounded by a wreath, crowned by "Noritake" in capitals and below also in capitals, Hand painted and Made in Japan. 962. Mark: Letter "M as in "Morimura" surrounded by a wreath, crowned by "Noritake" in capitals and below also in capitals, Hand painted and Made in Japan. Under this a legend in Japanese characters and # 43061. Pattern is known to collectors as "Christmas ball". 846. Mark: "Komaru" symbol crowned by "Noritake" in handwritten logotype format and below, "Nippon Toki Kaisha". This mark might seem similar to the #812 but it lacks the accent over the last "e". It is not an export mark either, so it ought to have been used in Japan. 812. Mark: "Komaru" mark crowned by "Noritake" in handwritten logotype format and below "Nippon Toki Kaisha". This mark was registered in 1949. "Nippon Toki Kaisha" ceased to be used in 1963. From a tourist souvenir plate from around 1950's. 870. Mark: "Komaru" (overcoming difficulties) symbol crowned by "Noritaké" in handwritten logotype format and below "Made in Occupied Japan". This mark seems to have been used only for one year, 1947, after which is was replaced by the pre-war Noritake backstamp in 1948. 871. Mark: "Komaru" (overcoming difficulties) symbol crowned by "Noritaké" in handwritten logotype format and below Â´"Made in Occupied Japan". This mark seems to have been used only for one year, 1947, after which is was replaced by the pre-war Noritake backstamp in 1948. 1047. Mark: "Komaru" (overcoming difficulties) symbol crowned by "Noritaké" in handwritten logotype format and below Â´"Made in Japan". This mark seems to have been in use 1947-1949. 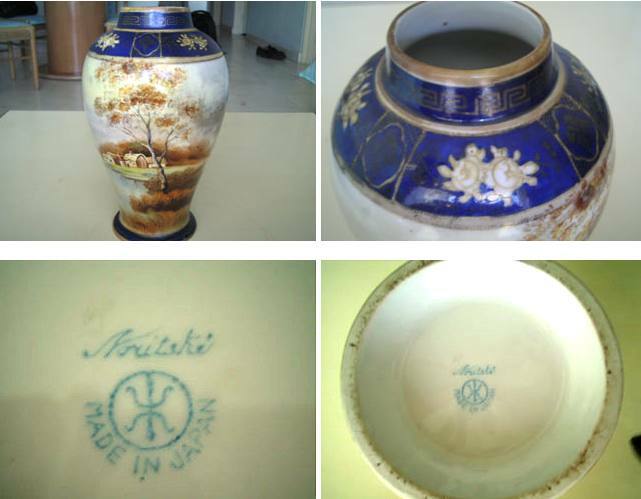 Noritake seems to have used 3 similar marks, one stating "Occupied Japan", one "Made in Japan", and one "Nippon Toki Kaisha". Mark from a 55 pcs Noritake dinner and tea set bought in April 1952. 958. Mark: Letter "M as in "Morimura" surrounded by a wreath below a crowned banner with the word NORITAKE in capitals, and below, "Japan". A Crown is very unusual in Noritake marks. Note also the absence of "R" as in "registered trademark". On a tea set purchased in Japan in 1946. Date: Mid 1940s. 977. Mark: Letter "M as in "Morimura" within a shield below the word NORITAKE in capitals, and below, "Japan". Mark registered in 1933. 858. Mark: Letter "M as in "Morimura" surrounded by a wreath with ribbons, crowned by "Noritake China" in capitals was registered already in 1933. The use of the Noritake brand name in combination with Occupied Japan dates this plate quite firmly to the 1948-1952 period. This mark should have been the one replacing the "Komaru" mark (#870, 871). The '4788' is the pattern number. 853. Mark: Letter "N" as in "Nippon Toki" surrounded by a wreath, crowned by "Noritake" in handwritten logotype format and below, "Japan". A similar mark with an "M" in the middle was registered already in 1933 and used until 1940. This mark with the N, was registered in 1953 both in Japan and North America and is currently in use. 869. Mark: "Rose China, Made in Occupied Japan". In use between c. 1947 to 1953. 855. Mark: Current mark, registered 1995. 867. Mark: "Noritake". Registered in the US April 10, 1956 as Serial #71687097. Registration numbers #0531659, 0624981. First use in commerce January 1, 1918. This mark differs at a closer look from later versions, by the to the modern eye 'cluttered' letter "k". 859. Mark: "Noritake N". Current mark, registered in the US as Serial #72170852, Filing Date June 12, 1963 and probably in the UK in 1962. 862. Mark: "Noritake N Ivory China". Current mark, registered in the US as Serial #73256397, First use in October 1962. 865. Mark: "Noritake Ireland". First use in commerce November 1977. Registered in US as Serial #73208311, Canceled in June 15, 2002. 866. 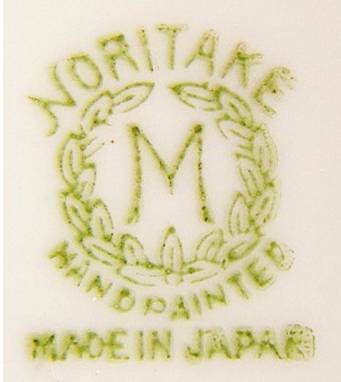 Mark: "Noritake (Since 1904)". First use in commerce 28 May, 1980. Registered in US as Serial #73275726, Canceled in March 29, 2003. 868. Mark: "Noritake Casual China". First use in commerce January 1963. Registered in US as Serial #72181390, Expired. The gotheborg.com marks section was originally initiated by a donation of marks from the porcelain collection of Karl-Hans Schneider, Euskirchen, Germany in July 2000. The section have since then been greatly extended by a large number of contributing collectors.